Government troops and allied militia launched their military campaign for Eastern Ghouta on February 18. Douma: Syrian regime forces on Saturday cut off the largest town in Eastern Ghouta from the rest of the rebel-held enclave near Damascus, pressing on with a 20-day assault that has left more than 1,000 civilians dead. Government troops and allied militia launched their military campaign for Eastern Ghouta on February 18 and have since overrun more than half of the area, defying global calls for a halt to the violence. The assault has followed a divide-and-conquer strategy, eating away at rebel-held territory, and government forces on Saturday successfully isolated Ghouta's main town of Douma in a blow for the beleaguered rebels. Regime fighters cut off a road linking Douma with the town of Harasta further west and also captured the town of Misraba, according to the Syrian Observatory for Human Rights. "Regime forces have therefore divided Eastern Ghouta into three parts -- Douma and its surroundings, Harasta in the west, and the rest of the towns further south," the Britain-based monitor said. Shelling and air strikes slammed into Douma on Saturday, trapping residents inside their basements for hours, AFP's correspondents in the town said. Rescue workers and medics were struggling to navigate the town's rubble-littered roads to bring wounded residents back to field clinics. At least 20 civilians -- including four children -- were killed in Douma on Saturday, in addition to 17 civilians in other battlefront towns, said the Observatory. The deaths raised the assault's total toll to 1,031 civilians, including 219 children, according to the Observatory. More than 4,350 have been wounded. Douma's opposition-run local council issued an urgent "distress call" on Saturday to international organisations. "The bomb shelters and basements are full, and people are sleeping in the streets and in public gardens," the statement said. "For three days, it has been hard to bury the dead because of the intense bombing on the cemetery," it added. Eastern Ghouta is the last remaining opposition-controlled zone on the outskirts of the capital, and rebels there have regularly fired rockets onto Damascus. 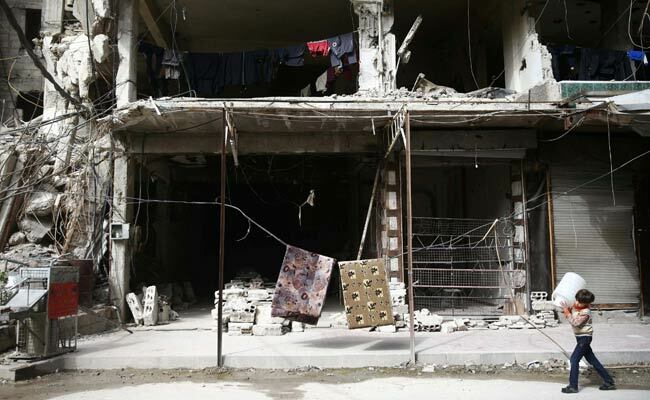 On Saturday, at least one child was killed and four other civilians wounded in rebel shelling on eastern districts of Damascus, according to state news agency SANA. Rebels have tried to slow the advance with an attempted counter-offensive, but President Bashar al-Assad's forces steamrolled their efforts. Syrian state television broadcast live footage from Misraba hours after it was captured by the army on Saturday, showing dozens of civilians in a dark basement, surrounded by troops. One elderly man broke down into tears as he relayed how his family had fled to Douma under fierce bombardment. Eastern Ghouta is home to around 400,000 people, living under a five-year siege that has made food and medical aid exceedingly rare. On Friday, an aid convoy by the International Committee of the Red Cross, the United Nations and the Syrian Arab Red Crescent delivered food to hunger-stricken residents. The UN refugee agency's Syria representative, who entered Ghouta with Monday's convoy, said the area was "on the verge of a major disaster". "I've never seen such scared faces in my life," Sajjad Malik said Friday. Two Islamist groups are the most prominent rebel factions in Ghouta, but jihadists from Hayat Tahrir al-Sham (HTS) -- once linked to Al-Qaeda's Syria branch -- also have a presence. On Friday, 13 HTS members and their relatives were bussed out of the enclave. Rebels said they would be taken to HTS territory in the northern province of Idlib, in an arrangement struck following consultations with the UN and international players. Such evacuation deals have been repeatedly agreed in Syria's seven-year war, most notably in the second city of Aleppo in late 2016. After a ferocious month-long government assault, thousands of rebel fighters and civilians were bussed out of the city's east. That paved the way for Syria's government to announce the full recapture of Aleppo -- the largest defeat to date for the fractured opposition movement. Syria's conflict erupted with protests against Assad but has since developed into a full-blown war drawing in world powers. Russia has intervened on Assad's behalf while Turkey has backed rebels against his regime, rival jihadists and Kurdish forces. Saturday, Ankara-backed rebels advanced against Kurdish militia in northwest Syria, coming to within two kilometres (just over one mile) of the flashpoint town of Afrin, the Observatory said. Elsewhere in Syria, the White Helmets rescue force suffered its first female fatality on Saturday, after air strikes hit a rebel-held town in Idlib province.